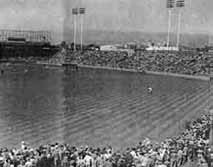 In the early years of the California League, the Oakland teams shared a home field with the San Francisco teams at the Recreation Grounds, Recreation Park or Central Park in San Francisco. A few noble efforts were made before the turn of the Century to create a home field in the East Bay, but none lasted longer than one or two seasons before both teams resumed playing in San Francisco. By the time the Pacific Coast League was formed in 1903, the Oakland Commuters as they were then known had a home field in the East Bay, although the team found itself playing many of their home games in other Northern California Cities. 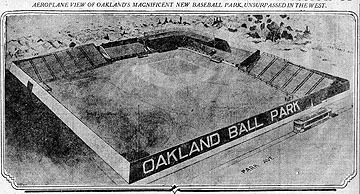 The Oaks finally settled down in Freeman's Park in Oakland, where they played until completion of their new ball park in Emeryville in 1913. The new park was just called "Oaks Ball Park," not named after any local hero, owner, or corporate sponsor. But for the next 42 years, through a Great Depression and two wars, it was the site of thousands of ball games that filled the afternoons and evenings with fun and excitement for generations of East Bay fans. Finally, in 1955, it would be torn down to make way for a Pepsi-Cola bottling plant, which itself would eventually be torn down to make way for a Pixar Animation Studio. In 1879, California League baseball was played at the Oakland Baseball Grounds located in West Oakland between 13th and 14th streets, and Center and Kirkham. This small park was home to both the Oakland and San Francisco teams of the California League that year because the rival Pacific Coast league locked up use of San Francisco's Recreation Grounds. By the 1880 season, both teams resumed playing in San Francisco. In 1886, both the Oakland and San Francisco teams of the California League played at the Alameda Baseball Park, located north of Central Avenue near Neptune Beach, between Seventh (later Webster) and Page streets, in Alameda. With a seating capacity near 2,000, this park, sometimes known as the Alameda Athletic and Baseball Grounds, hosted an historical appearance (or non-appearance of heavyweight boxing champion John L. Sullivan. On November 14, 1886, the day after he KO'ed Paddy Ryan in San Francisco, Sullivan was scheduled to umpire a game between the San Francisco Pioneers and Oakland's Greenhood & Moran baseball team before an expected crowd of no more than 12,000. When an uncontrollable crowd of more than 18,000 fans showed up, Sullivan had to be whisked away in order to prevent a riot. The following year, 1887, both teams again resumed playing in San Francisco. Oakland began playing its California League home games in 1890 and '91 at a cold and windy location known as the Emeryville Grounds close to an iron plant that let out toxic black smoke. To alleviate this untenable situation, in 1892, club manager Col. Tom Robinson made arrangements with the Piedmont Cable Company to build a new ball field near an attractive swimming pool and spa at the north end of Lake Merritt known as Piedmont Baths. This facility, located at the southeast corner of 24th and Waverly streets, was built on a small plot measuring only 320 feet by 450 feet, resulting in a playing field with a right field foul pole just 218 feet and a left field foul pole just 276 feet from the plate. The grandstand seated only 650, and the bleachers accommodated only 450 fans. The park was beautiful but just too small. It served as the Oakland team's home for only two seasons. Built in 1899 at the northwest corner of 59th and San Pablo in Oakland, Freeman's park with a seating capacity of 7,000 was home to Oakland's California League and Pacific Coast League teams until 1904, when the Oakland team moved to Idora Park. In 1907, the team moved back to Freeman's Park, where it stayed until 1913. Idora Park was a 17 acre amusement park bordered by 56th and 58th streets, and Telegraph and Shattuck avenues, in Oakland. In 1904 a ball park was built in the park. It had a double-deck grandstand with 3,000 seats in a quiet rural setting. 1905 was the year the league extenced the season into December and the attendance dropped substantially. As a result, the Oakland team began traveling, playing home games in San Jose, Sacramento, and other Centeral Valley locations. As noted, the "Commuters" moved back to Freeman's Park in 1907. After the Oaks won their first Pacific Coast League pennant in 1912, the Oaks management decided to build a larger facility. A 465 foot square plot of land, which included the original Emery family homestead, was found at San Pablo and Park Avenue in Emeryville. Ground was broken on December 15, 1912, and construction began on February, 1, 1913. The new facility was completed by March 15, 1913, at a cost of $80,000. An automatic sprinkler system was installed, and the turf was ready by Opening Day 1913. At the time of its completion, the park seated approximately10,000 in 19 sections of grandstands plus bleachers. All seats in the grandstands were stadium chairs, with nine sections behind the plate shaded by a cover. The seating in the bleachers past the dougouts, however, was on planks. Outside the park, popular bars and restaurants served the fans, players, and working class neighbors. From 1913 to 1922, the team played a portion of its schedule in San Francisco, but after 1922 the Oaks began holding all of their home games at Oaks Park. Lights were installed in 1931, although players complained that they created difficult shadows, especially in the outfield. 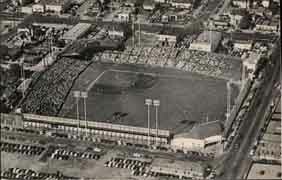 After Brick Laws and Joe Blumenfeld purchased the club from Cookie Devincenzi at the end of the 1943 season, they spent $250,000 to renovate the park. The improvements included new light standards, expanded grandstands, new bleachers in right and center field adding 3,000 seats, and new seats down the right field line. The club houses were also moved from center field to the area under the grandstand. That move helped prevent the stealing of catchers' signals by using binoculars in center field. It also made it easier for kids to collect autographs in the walkway from the clubhouse to the dougout. The brick structure at the entrance to the park behind the left field bleachers was modernized into a stucco facility with an excellent view of the diamond. The business and ticket offices were enclosed in that structure. The weather conditions at Oaks Park are excellent. There is a light breeze off the Bay, which sometimes makes it more difficult for left handed hitters to hit them over the fence. The park is conveniently located within a short walk from the Key System train station and trolley car stops. A fire station is also nearby to protect the all wooden structure from any small fires spreading. Kids who go to the park with their dads will remember their experiences forever. The sounds of the vendors shouting "ice cream a dime" and "red hots," and the smells of hot dogs, freshly mowed lawn, and (yes) cigar smoke eminating from the stands. You can sit in the green wooden folding seats in the grandstand, and to avoid splinters and sit up a little higher you can rent a cushion for a nickel. After the game, kids can exit the park through the center field gate, which allows them to cross the playing field, and even take a quick run around the bases. If they are bold enough, the kids can even get to the park on their own on the Key System train, trolley or bus, and can sit in the right field bleachers for a dime. Copyright �William B. Shubb, 2002.